Congressional Gold Medal, Coretta Scott King, Martin Luther King Jr.
With all of the Inaugural buzz surrounding the District this week, it’s important to take time to reflect upon other important people our nation honored this week. The Congressional Gold Medal has been bestowed by Congress since the American Revolution as its highest form of national appreciation. This award is given to those with the most distinguished achievements and contributions to society. Each of these medals is awarded to a particular individual or institution. All Congressional Gold Medal legislation must be cosponsored by at least two-thirds of the Members of the House, and 67 senators must cosponsor any legislation before it can be considered by the Senate Banking, Housing and Urban Affairs Committee. 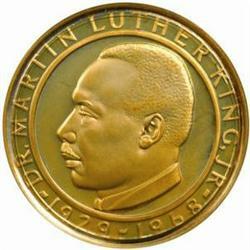 In 2004, Dr. Martin Luther King Jr. was posthumously awarded the Congressional Gold Medal, along with his wife Coretta Scott King. They were recognized as the first family of the civil rights movement. Through his teachings of nonviolence, Dr. King was able to inspire the American people to stand up against segregation and racial injustice. Despite Dr. King’s tragic assassination, his teachings lived on through Mrs. King as she devoted herself to developing the Martin Luther King Jr. Center for Nonviolent Social Change. This center serves not only as a memorial to Dr. King, but also provides individuals with training programs in his philosophies and methods. The Congressional Gold Medal is created by the United States Mint, specifically designed to commemorate each recipient. Like the accomplishments of those who receive the award, each medal is unique. 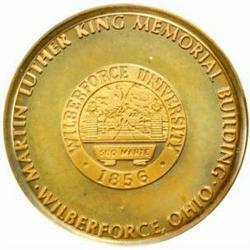 The back of Dr. King’s medal reads “Wilberforce University”. Wilberforce was a primary stop on the Underground Railroad and is also the site of the National Afro-American Museum and Cultural Center. It is no easy task to receive an award of such distinction. Any thoughts as to who deserves the next medal? Brumidi, an Italian political refugee and artist trained in Rome, arrived in the US in 1852. He visited the Capitol in December 1854 and won a tryout from construction superintendent Capt. Montgomery Meigs: paint a fresco in a lunette in what would become the Committee on Agriculture’s room. Brumidi’s “Calling of Cincinnatus from the Plow” earned him the job of decorating the Capitol. He spent the rest of his life working on committee rooms, corridors, and the Rotunda. The Dome holds his most famous and iconic work, “The Apotheosis of Washington,” as well as the “Frieze of American History,” a fresco that mimics relief sculpture to depict key moments in American history, beginning with Columbus’ landing. Brumidi’s medal will be displayed in the Capitol Visitor Center, where you can see it before taking a tour and staring in amazement at Brumidi’s work. As is the case with many Congressional Gold Medals, Suu Kyi’s was awarded during a ceremony in the Capitol rotunda. Congressional leaders and high-profile supporters of Burma’s democracy movement praised Suu Kyi’s commitment to democracy and human rights and noted how they had been personally inspired by Suu Kyi’s perseverance and courage. The obverse (heads side), designed and sculpted by United States Mint Sculptor-Engraver Don Everhart, features a portrait of Suu Kyi with the inscription DAW AUNG SAN SUU KYI around the border. The likeness of Suu Kyi was based on the photograph by Eddie Adams. The reverse (tails), also designed and sculpted by Everhart, depicts a peacock with the inscriptions DEDICATED TO PROMOTING FREEDOM AND DEMOCRACY IN BURMA and ACT OF CONGRESS 2008. Congress first awarded a Gold Medal in 1776—to General George Washington. Early recipients of Congress’ highest honor were all in the military, but eventually Congress broadened the scope of the award to recognize people in many fields (and from other countries) for great achievements, significant contributions, or lifetimes of service. Recent recipients have included Arnold Palmer, the Tuskegee Airmen, and the Dalai Lama. In the summer of 2000, Congress awarded medals to cartoonist Charles M. Schulz, Pope John Paul II, and Ronald and Nancy Reagan. Each medal is unique. The legislation awarding the medal directs the US Mint to design and produce a medal that depicts the person or event being honored. If the legislation allows it, the Mint may also produce bronze copies for sale to the public. It is nearly the third Monday in January and therefore almost time to once again celebrate Martin Luther King, Jr. Day, a day not only set aside to celebrate the slain leader of the civil rights movement, but also a day that many Americans devote to national service. Although it seems commonplace to most people under the age of 25 that we celebrate this day as a national holiday, it was a long and bumpy road for that day to finally come. As we did with looking at some of the history and debates behind the celebration of Columbus Day back in October, we think it’s worthwhile to reflect a bit on the controversy that this holiday endured on its way to a spot as a national holiday. As most Americans know, on April 4, 1968, Reverend Dr. Martin Luther King, Jr. was assassinated by a gunman in Memphis, TN as he stepped out of his motel room. Dr. King was in Memphis to march alongside striking sanitation workers prior to kicking off his planned Poor People’s Campaign soon afterward. Just four days after his assassination, Congressman John Conyers (D-MI) introduced the first legislation to create a Martin Luther King, Jr. federal holiday, but Congress chose not to move forward on the legislation. Every year after, Conyers would continue to submit the legislation for consideration, but to no avail. Beginning in 1971, the Southern Christian Leadership Conference (SCLC), the group that Dr. King helped found and lead, began joining the effort, along with the recently created Martin Luther King, Jr. Memorial Center in Atlanta, to push for a federal holiday commemorating King’s birthday (which was January 15, 1929). In April 1971, the SCLC presented Congress with petitions they had gathered that contained 3 million signatures in support of such a holiday; however, Congress still didn’t take action on the legislation. In 1973, Illinois became the first state to sign a King Holiday bill into law, with Massachusetts and Connecticut following suit the next year. In 1975, the New Jersey State Supreme Court ruled that, in accordance with the NJ state government’s labor contract with NJ State employees, the state must provide a paid holiday in honor of Dr. King. In the fall of 1978, the National Council of Churches called on Congress to pass a holiday to commemorate Dr. King, but still no legislation was moved forward. Coretta Scott King would testify before the Senate Judiciary Committee, as well as before Joint Hearings of Congress, in support of such legislation before mobilizing a nation-wide campaign for a national holiday through the King Center in 1979. The Conyers bill made it through the committee process but was defeated in the House by just five votes. In 1980, Stevie Wonder’s hit “Happy Birthday” celebrated King and advocated a holiday in his honor (Wonder was a vocal supporter of the King holiday). Over the next several years, Coretta Scott King’s work with the King Center to establish the holiday included a focus on state and local commemorations as well as new petition drives and additional testimony before Congress. Finally, in August 1983, the House passed the King Holiday Bill by a vote of 338-90; the Senate passed the bill in October, 78-22. On Nov. 3, President Ronald Reagan signed the bill, and beginning in 1986, the third Monday of January was designated the Martin Luther King, Jr. National Holiday. Do you remember any of the debates over the King holiday, or have a strong opinion about how to commemorate King’s life and work? Let us know in the comments.